This is the Machine end hose end for Miele Canister Vacuum Cleaners. There are several to choose from. Please check your model number to determine the correct drain elbow / hose end below. This is the Machine end hose end for Miele S200 Series Canister Vacuum Cleaners. 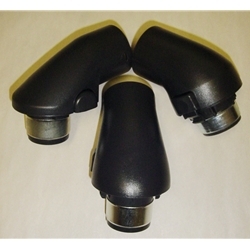 This is the Machine end hose end for Miele S500 and S600 Series Canister Vacuum Cleaners.